When light hits a solar cell, electrons get excited and begin to move about — and that’s what generates a flow of electricity. Silicon, the semiconductor commonly used in solar cells, is especially good at converting sunlight at certain energy levels, but it loses the rest of the sunlight that hits it as heat. Researchers from Delft University of Technology, Toyota Motor Europe and the University of California-Irvine have developed a way to put that extra energy to work, recapturing some of the portion that is lost as heat. They combined lead and selenium to create tiny dots 10,000 times thinner than a human hair that could pepper a solar cell. Juse like in silicon, electrons are capable of moving around in the dots once excited. If an electron absorbs high-energy sunlight, it moves around in the dot and bumps into other electrons. Energy is transferred and the bumped electrons hit the right energy level to join the flow of electricity. Until the researchers’ study, which was published in Nature Communications August 23, there was a hiccup in this process. While the energy transfer between electrons worked, they remained trapped in the dots, unable to join the flow of electricity. The researchers noted this was due to large molecules on the dots’ surface, which hindered electrons’ ability to move in and out. 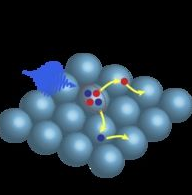 They swapped in smaller molecules so the electrons could move freely. Solar cells generally convert 10 to 20 percent of the light that hits them into electricity. Cells that incorporate the dots theoretically could be 45 percent efficient–about 10 percent higher than a conventional cell’s theoretical limit. Alternatives to silicon could push that limit even higher in the future. Wow, great! I personally see solar energy as the best choice of renewable energy for future.